Are you in the market for a body wash? If you’re looking for the best body wash for men, we understand how confusing it can be to shop around and compare different brands and body wash products. A top-rated men’s body wash and shower gel must be made of natural, high-quality ingredients, offer moisturizing and exfoliating benefits, work well with dry, itchy and sensitive skin, and keep you smelling your best all day. Currently, the best body wash to use is Oleavine’s Tea Tree Antifungal Body Wash. Free from harsh chemicals and loaded with conditioning and moisturizing ingredients that will leave your skin feeling clean and soft, this antibacterial wash is the highest-rated product on the market. Similarly, guys can choose between 18.21’s Man Made Wash and Brickell Men’s Invigorating Mint Body Wash. Both body wash products offer premium natural ingredients designed to cleanse your skin and smell great. However, if your budget is a concern, Every Man Jack’s Body Wash is the best smelling, natural body wash for men that is also very affordable. If you’re ready to stop using bar soap or sharing your body wash with your girlfriend and need a good shower gel for guys, our reviews below will help you find the right product suited for your skin type and needs. Whether you need the best body wash for dry skin, an organic antibacterial and antifungal soap for athlete’s foot or jock itch, or just a great masculine smelling gel for men with active lifestyles, you’ll appreciate our list of top products. From moisturizing body wash that hydrates dry skin to exfoliating products that remove dead skin cells and leave your skin feeling nice and smooth, there are many different types of shower gels for men to use. Here are the best natural, organic, moisturizing body wash products for men to get! If you need a versatile body wash that’s good for athlete’s foot, jock itch, nail fungus, body odor, and acne but is also made of organic ingredients so it’s soft on sensitive dry skin, you can’t go wrong with Oleavine. As our pick for the best body wash, Oleavine’s Antifungal Soap with tea tree oil can have the manliest of men smelling fresh and clean. Combined with a professional-grade tea tree oil, this all-natural body wash is filled with skin-soothing essential oils that eliminate odor while calming skin conditions such as acne and eczema. And with no harmful chemicals, parabens, sulfates, preservatives, thickeners, detergents, synthetic fragrances or dyes, Oleavine’s rich hydrating properties cater to those with sensitive skin who are prone to irritation, and the botanicals in this wash moisturize and soothe the skin. In short, it’s the best men’s body wash for sensitive skin. The most appealing aspect of this body wash may be its superior antibacterial effects that keep various infections at bay. Neem oil and other antibacterial extracts work to prevent athlete’s foot, jock itch, and even ringworm – all while eliminating odor, meaning it doubles as a deodorant body wash. Although this product is unisex, guys will love the tea tree and mint scent, as most men find it fresh and invigorating. Ultimately, Oleavine Antifungal Soap is gentle on your skin yet fierce against odor and infection, making it the total package when it comes to a feet and body wash. This product takes the top spot, for athletes and the working man alike. If a unisex shower gel just won’t cut it, then 18.21 Man Made Wash is the best body wash for men overall. 18.21 Man Made is a company dedicated to developing the finest men’s grooming products. The brand’s luxurious wash is inspired by one of the most masculine drinks of all time – whiskey. This classic paraben-free wash provides ample hydration for dry or rough skin, and the combination of quality ingredients will have you reaching for this bottle every time you shower. For starters, jojoba, macadamia, and quinoa deliver intense moisture and a slight sheen to your skin. While not specifically marketed for dry or sensitive skin, the sulfate-free and pH balanced formula is gentle enough for guys with allergies. And as an all-in-one shampoo, conditioner and body wash, guys can use this product on their skin and body. The fully rich lather offers a non-greasy finish that serves to strengthen your body’s health by hydrating and moisturizing. Effective on all skin or hair types, we can’t recommend this wash enough. Last but not least, the brand’s signature scent – sweet pipe tobacco – is simply delightful. The light fragrance of sweet tobacco mixed with vanilla, spicy saffron, tonka bean and dried fruit provides the ultimate ode to masculinity. This makes it arguably the best smelling body wash.
For intense hydration that will leave your skin looking and feeling great after, invest in a bottle of 18.21 Man Made Wash and revolutionize your shower experience. Brickell is a company with beginnings as unique as its products. Started in 2014 with a mission to create the highest-quality men’s grooming products, Brickell Men’s Invigorating Mint Body Wash is made with all-natural, organic ingredients that leave your skin clean, hydrated and smooth. The combination of aloe vera, jojoba oil, glycerin, tea tree oil and vitamin E work together to provide intense moisture to your skin while eliminating bacteria. This body wash has a lather that provides a deep clean, and the smell of real mint and peppermint gives your skin a light, uplifting fragrance without any chemical additives. Simply put, it’s a great wash for guys with sensitive skin. Gentle and effective on all skin types and even hair, guys love the morning boost this body wash provides. Free of chemicals or sulfates, Brickell Men’s Body Wash is sure to put a pep in your step with its skin-boosting benefits. Although more expensive than other washes, we recommend you give it a try and feel the difference. Jack Black is a brand that understands the importance of all-natural products that do their job and do it exceptionally well. Because of this, Jack Black’s products have made it onto most of our lists of top men’s grooming products, signaling that they pay attention to quality across all their product lines. Jack Black Turbo Wash Energizing Cleanser contains no parabens, alcohols, coolants or synthetics, and its dermatologist-tested vegan ingredients leave your skin impeccably clean and smooth. For one, the wash’s organic green tea works to remove bacteria and calm inflamed skin, while coconut and palm-derived surfactants cleanse the hair and skin. The subtle scents of eucalyptus and rosemary provide a light, unique fragrance that delights and soothes the senses. Really, it does smell amazing! Get rid of dirt and grime while essential oils calm your skin and muscles. Jack Black’s Cleanser for hair and body is a little pricey, and that’s the only downside, but the superior quality of this body wash is anything but cheap. One sniff of this good smelling body wash will have you feeling energized, and your skin looking healthier than ever. Looking for an eco-conscious body wash brand? Every Man Jack delivers an incredible scented product that goes above and beyond when it comes to a rich lather that will rejuvenate your skin. For a deep lean that removes dirt and germs without irritating or drying out your skin, this cruelty-free wash is definitely a winner, for more reasons than one. With subtle hints of rosemary, sandalwood, and sage, this is the best men’s shower gel for guys who can’t get enough of earthy, light scents. The foamy lather of this body wash will get you clean and fresh without using a ton of product. Plus, the essentials oils and glycerin will keep your skin hydrated, smooth, and soft. Lastly, you’ll see no parabens, dyes, or sulfates on the ingredients list, making it good for guys with sensitive skin. Given the high-quality make of this wash, its intoxicating yet masculine aroma that comes scented with your choice of Cedarwood or Sandalwood, and the brand’s dedication to a planet-friendly cause, Every Man Jack’s Body Wash and Shower Gel is extremely affordable compared to other products on our list. If you’re tired of washing your body with products full of carcinogenic chemicals but want to stick to a budget, Every Man Jack’s can help fulfill your needs. Molton Brown is an English company that creates luxury grooming products that set the standard. The premium Molton Brown Body Wash provides an exceptional fresh feeling while cleansing your skin of any impurities. The brand’s shower gel products combine this amazing smelling ingredients for a gentle body-cleansing wash that will tone down irritations and eliminate dryness on the toughest of skin. However, it is definitely worth-noting that all the company’s body wash products have an equally great scent. Black pepper, lemon, ginger, basil, coriander and violet leaf give this body wash an intense kick, but it is never overpowering. Black pepper oil detoxifies the skin and even helps to relax muscles, giving it some serious soothing effects. Beyond being one of the best smelling body washes you can buy, Molton Brown isn’t just an extravagant product for the sake of it. This product eliminates skin toxins, hydrates rough and dry skin, detoxifies the body while relaxing your muscles, and is very effective in small amounts. And as expected, it’s very highly-rated on Amazon. Although more expensive than its competitors, Molton Brown Body Wash adds a luxurious spice to your everyday routine. If you can afford it, you certainly won’t regret getting it. Molton Brown Bath & Shower Gel, Blissful Templetree, 10 oz. Puracy is a Texas-based company that knows how to go natural when it comes to body wash for guys. 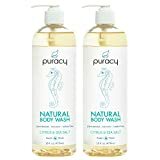 Puracy’s Natural Body Wash contains no artificial dyes, fragrances, or parabens, which equates to one seriously skin-friendly product. With thousands of reviews on Amazon, all skin types would benefit from Puracy’s top-rated moisturizing body wash and its natural ingredients. Perfect for both men and women with sensitive skin, this best smelling body wash for guys is extremely versatile. The beachy, natural scents of citrus and sea salt come together to leave your skin refreshed, and Himalayan sea salt works to exfoliate tired and dull skin. It was created by chemists so you know your skin is in great hands with this nourishing wash.
One of the main ingredients, coco glycinate, creates a foamy lather without disrupting your skin’s pH balance. Keeping your pH balance in check helps to eliminate skin irritation, redness, and dryness. Men suffering from skin conditions such as eczema and dermatitis can rejoice – Puracy Natural Body Wash is a great option that won’t cause issues for your skin. Plant-based and free of chemicals, this body wash is seriously one of the healthiest around. Men who need a deodorant body wash that is strong enough to eliminate body odor yet gentle enough to soothe sensitive skin can count on Purely Northwest to deliver. Purely Northwest Antifungal Tea Tree Oil Body Wash works against odor, dirt, and grime, while essential oils and botanicals work to nourish every inch of your skin. Containing no parabens, artificial dyes or fragrances, this is one of the best body wash for men’s odor. This antifungal tea tree oil body wash is extremely versatile, and it can be used as a body wash as well as an effective shampoo. It’s a good men’s body wash for hard laborers and athletes, as it combats sweat, dirt, and odor at the source. Aloe vera, Atlantic sea kelp, tea tree and eucalyptus condition and smooth irritated skin. 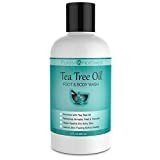 Use it in your next foot bath to smooth your feet and cleanse your toenails or fight jock itch, acne and eczema – this body wash literally does it all. It even comes with a 100% satisfaction guarantee, making this Antifungal Body Wash a no-risk purchase. When it comes to names, Rugged & Dapper is a company that gets straight to the point. Men looking for a grooming product that takes care of their masculine skin with a low-maintenance approach, this brand makes a point to deliver an all-in-one, head-to-toe soap as the solution. 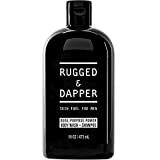 Rugged & Dapper’s Shampoo and Body Wash takes care of odor, dirt and grime, and replenishes moisture where guys need it most. First things first, this is one of the best smelling men’s body wash on the market. As a men’s natural body wash, ingredients such as tea tree oil, borage oil, rose hip oil, and orange peel tincture give your skin a light citrus scent with woodsy hints from the various essential oils. It also deep cleans and deodorizes your skin and hair, making it a powerful product that is gentle on even sensitive dry skin. Rugged & Dapper’s Shampoo and Body Wash has a rich lather that will leave your skin smelling manly and feeling super hydrated all day. Whether you have oily or dry skin, this awesome body wash will keep you clean and moisturized. NIVEA is one of the largest and most trusted brands in the world when it comes to getting your skin fresh and clean on a budget. NIVEA Men’s Odor Protect Body Wash is actually a 3-in-1 product, and works to cleanse your body, face, and hair. Its formula packs a powerful punch, especially when it comes to combating odor-causing bacteria, making it one of the best deodorant body washes. This great smelling wash contains silver ions that eliminate germs and body odor, so you know you will be smelling fresh long after showering. Although it contains added dye and fragrances, this shower gel provides a deep-cleaning lather that rinses off easily. And at a more affordable price than the top-tier products, there had to be a trade-off somewhere. Nevertheless, you’ll love the scent so maybe you can live with the fragrant additions. Guys everywhere enjoy the beachy scent with a hint of citrus, and it works well on all skin types. 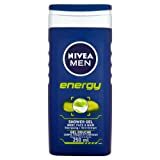 NIVEA Men’s Body Wash is the cheapest option for men looking for clean skin and a light fragrance after every wash. This scented body wash takes deep-clean and long-lasting odor control to the next level. Aveeno’s grooming products are not just for women. The brand’s Daily Moisturizing Body Wash is the epitome of hydration, and guys with dry, sensitive skin will especially benefit from this shower product’s gentle, replenishing formula. To make this possible, this top body wash uses no dyes, parabens, or fluorides for a hypoallergenic approach. The secret to Aveeno’s moisturizing success is in the main ingredient. Oatmeal soothes dry skin with intense hydration, cleaning and protecting the skin. This wash has a light scent that is pleasant but not at all harsh, which adds to the natural approach to this men’s body wash. 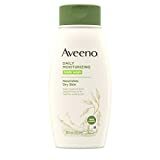 Recommended by dermatologists, even men with the most irritable skin can have confidence in this moisturizing wash. Aveeno’s Body Wash works to relieve dry skin yet is powerful on all types, making it a staple for guys wanting healthier skin. Dove has dominated the entire self-care and grooming sector for decades, and the company’s Body Wash Pump for Sensitive Skin is another award-winning, sulfate-free product. As the cheapest body wash on our list, on a per ounce basis, if you need a good-quality cleanser on a budget, this moisturizing wash might be the solution you. Hypoallergenic and soap-free, this body wash is another product that is perfect for sensitive skin. It doesn’t contain any sulfates, which prevents skin irritation. Recommended by dermatologists, this body wash combats dryness with moisture that your skin craves, resulting in a softer and smoother finish once you’re out of the shower. Furthermore, the brand’s Nutrium Moisture technology provides your skin with the nutrients it needs, so you can say goodbye to unhealthy, dull skin. Dove Body Wash is a shower essential for guys that want to deep clean and nourish simultaneously. The best shower gel for men removes dirt, sweat, odor and bacteria while moisturizing even the toughest and driest of skin. Body wash has quickly taken over the men’s grooming industry, and you have a wide range of products to choose from to fit your personal skincare needs. However, picking a good body wash that suits your skin can be tricky. Considering a few critical factors can help you select the perfect wash for clean, hydrated skin with every shower. Here are some things to think about when buying a top men’s shower gel. Know your options. Shower gels, moisturizing washes, and exfoliating washes all serve different purposes. Shower gels achieve a deep-clean, while moisturizing body washes contains essential oils and organic ingredients for a creamier texture and intense moisture. Exfoliating body washes have some grit to remove dead skin cells and keep your skin super smooth. Most of the options above incorporate many of these benefits and features into one product. Identify your skin type. Guys with sensitive skin should reach for an organic moisturizing body wash without any added dyes, fragrances or chemicals. Dry skin works best with a moisturizing wash as well, especially shower products with natural ingredients. If your skin is oily or acne-prone, an exfoliating body wash helps to combat troublesome skin by removing dead skin and keeping your pores clean. Since we almost exclusively picked products with the highest-quality ingredients, almost all of them are good for dry, sensitive skin. Zone in on ingredients. You should always be aware of what ingredients you are putting on your skin. Moisturizing ingredients such as glycerin help to keep skin hydrated and smooth, but you won’t believe the types of chemicals some manufacturers add to their shower products. Harmful chemicals such as sodium lauryl sulfate and ammonium lauryl sulfate can irritate your eyes and even damage your scalp. The sad part is that, almost everything you pick up at Walmart, Target, and your local grocery stores are loaded with sulfates, parabens, dyes, artificial additives, petroleum, alcohol, and other chemicals you should avoid. Not all fragrance is created equal. All men want to smell incredible, but make sure your body wash contains all-natural fragrance from essential oils and organic sources (e.g. mint, citrus, jasmine, cedarwood, sandalwood, etc.). Artificial fragrances are created with thousands of chemicals and can irritate your skin and nose. Finding good shower products doesn’t have to be mission impossible. We’ve pinpointed the best options on the market, for men of all skin types. One of these products is sure to keep your skin in amazing shape while providing a clean, but natural fragrant finish! While we’ve definitely reviewed and listed the best men’s body washes the industry has to offer, it’s always good to know all of your grooming options. Many men debate between body wash and bar soap. Although both have the job of cleaning your skin, knowing the distinct difference between the two will help you decide whether body wash or bar soap belongs in your shower. Body wash, as a whole, is obviously a little pricier, but it also does more to enhance the quality of your skin. Many washes contain moisturizers and conditioners that smooth and soften skin instead of just cleaning it. You can even find deodorant products that protect against a number of bacteria and fungi or exfoliating washes which remove dead skin cells for a healthy, shiny complexion. Bar soap is significantly cheaper, and it will last much longer in the shower. Despite the lower price point, bar soap has a higher pH level than body wash, which may dry out your skin. If bar soap is your personal preference, be sure to look for a soap that contains glycerin. This ingredient acts as a moisturizer, so you can get clean while staying smooth. Whatever product you choose, be sure to keep in mind that the health of your skin is a long-term investment. After all, you’re going to be living in the same skin for the rest of your life so it’s important to maintain proper skincare. Start now with a good skincare routine and never have to worry about buying anti-aging products in the future.